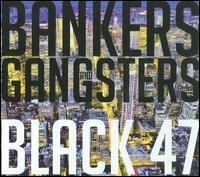 Snob's Music: Black 47: "Bankers and Gangsters"
One would think that after 20 years and 13 albums it would become harder to write songs, particularly the types of storytelling songs that comes from Black 47's Larry Kirwan. Well, maybe it's the author within him (Kirwan's second novel was recently released), but there's no writer's block on Bankers and Gangsters, the fourteenth album from the band. The subject matter is far more diverse this time around than what we got on 2008's Iraq. Kirwan treats listeners to tales of life in New York City ("Long Hot Summer Comin' On") and his Irish homeland ("Red Hugh"). Along the way we're introduced to characters of whom all manner of unfortunate circumstances befall. From a young woman chasing trends ("Celtic Rocker") to a search for the recordings of Jimi Hendrix last gone horribly awry ("Long Lost Tapes of Hendrix") to the "Black Velvet Band"-meets-Jean Valjean of "Bas in Eireann", Kirwan keeps us riveted with his narrative. Although a little less overtly political, there is still a pointed tongue at work. The title tracks is a scathing critique of CEO greed and corporate bailouts. Musically, there's not much new here. There may be a little more reliance on horns, which sound too slick in contrast to Kirwan's less than perfect vocal style, but the backbone of Black 47's music remains the Celtic Rock sound they helped pioneer. That shines through on songs like the waltzing "Yeats and Joyce" and "Izzy's Irish Rose", a track which playfully blends Irish and Hebrew influences. The most delightful though is the fun and flirty "Wedding Reel", a track I wish was around on my wedding day. From time-to-time the arrangements do begin to have difficulty in engaging the listener. Songs like the epic "Red Hugh", "One Starry Night" and "The Islands" fail to ignite on a musical level. Thankfully, the storytelling is strong enough to pull them through. It's unrealistic to expect an artist to create their best work this deep into their career. However, Black 47 do an admirable job adding another enjoyable and meaningful chapter to their own story. Best tracks: "Celtic Rocker", "Wedding Reel"